1. So, let’s start off with the bad news. Chapter House might not be happening. Josh Brokaw at the Ithaca Times had the scoop, though not for a lack of trying on the Voice’s part – rumors had arrived in the inbox well before the Collegetown construction roundup article. I’ve reached out to Jerry Dietz, the building manager for the Chapter House project, four times over the past couple of weeks, without response. One of those was an in-person visit that went un-received. My Voice editor and colleague Jolene Almendarez has also been trying to do her share of contacting relevant parties, to no avail. Anyway, personal discontent aside, The co-proprietor of the Chapter House (and the only one willing to say anything on record) says that he believes a sale of the 400-404 Stewart Avenue property is imminent, with the potential buyer being the next door neighbor of the also-destroyed 406 Stewart Avenue. The claim is that a more cost-efficient plan would be put forth, which could eliminate the Chapter House from its plans. One thing to keep in mind is that the property is on the edge of the East Hill historic district – the Ithaca Landmarks Preservation Commission can control just about every aspect of the exterior, but they don’t have say over use any more than zoning permits. They can stipulate the extra expense of appropriate material and image, but they can’t stipulate a bar (and a lot of commission members would be uncomfortable with that anyway). Dunno how much the insurance money was, but the finances just may not work. It would be unfortunate, but as they do in golf, they’ll play the ball where it lies. 2. Noting, briefly. Evan Monkemeyer, the developer behind the cancelled College Crossing project, might be partnering with another developer to create and put forward a plan for the corner of Route 96 and East King Road. This is according to the town of Ithaca’s planning staff. Monkemeyer has not hidden his discontent after his suburban-style mixed-use project became the subject of heavy debate because the site plan, originally approved in 2007, no longer meshed with the town’s interests, which had evolved to more New Urbanist formats put forth by the 2014 Comprehensive Plan and the Form Ithaca charrettes. Monkemeyer owns about 64 acres on the northeast side of the intersection, and more than 15 acres as part of Springwood on the southeast side of the corner. In other words, virtually all the divvied up land and conceptual buildings on the lower right side of the charrette image. This could be something to keep in eye on over the coming months. 3. Here’s the latest iteration of the Maplewood Park site plan. A lot of changes from the previous version. To sum up the changes, the apartment buildings, 3-4 stories, have been pulled back from existing homes, the townhouses and stacked flats have are more centralized and closely clustered, and mixed-use retail/apartment planned for the city is now in the town, all the city has in its portion is green space and perhaps a small service area/ bus shelter. Also note the secondary road that terminates right at the edge of the Maple Hill property. 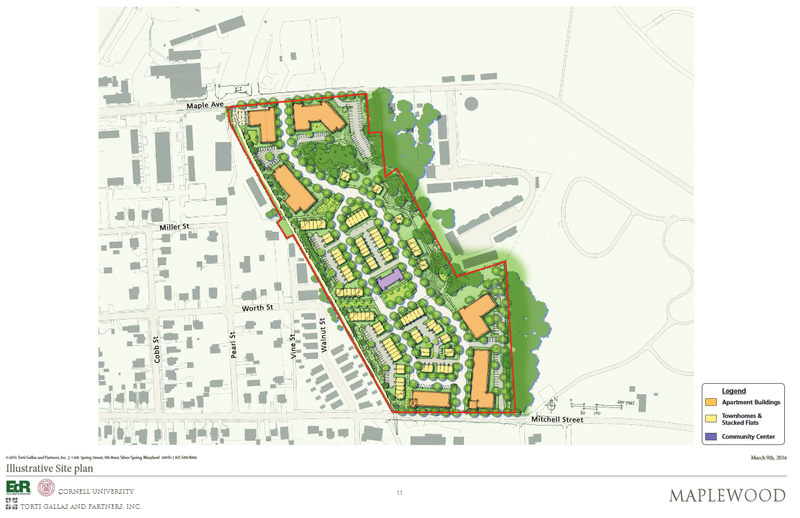 Chances are very good that would feed into a phase II that redevelops the Maple Hill property. The large parking lot in the southeast corner doesn’t seem to jive with the rest of the plan, previous versions had the parking more dispersed. Since Cornell has an idea of the number of residents it wants for the project to be feasible to build and affordable on grad student stipends (850-975, centering around 925 beds in 500 units), if housing is decreased in one part of the parcel, they’re going to have their development team make up for it somewhere else. One of the bigger points of contention seems to be Cornell trying to avoid drawing traffic in by keeping larger buildings further out, while neighbors from various angles try and push the units as far away from them as possible. Maplewood has a website up sharing meeting notes and presentation materials here. Future meeting information will also be posted to the Maplewood website. The project will be filling out an Environmental Impact Statement (EIS) not unlike Chain Works, because of the project size and potential for adverse impacts (and therefore the need for proper mitigation before plans can be approved). The scoping document for the EIS, which is an outline that says what will be written about where, is on the town’s website here. Just for the record, the print version of a recent Maplewood write-up on the Times claimed to have a quote from me. It was not. The online version of the piece has the corrections. The quote wasn’t even something I would say, because I don’t think Cornell attempting to house a greater number of its graduate and professional students is an “unsustainable development goal”. Quite the opposite, it’s crucial they do that to relieve some of the pressure on the rest of the local housing market. 4. Looks like some of the IURA’s recommended funding Action Plan is out. Habitat for Humanity gets the full $75,000 request, as does INHS with the $100,000 requested for their new single-family build at 304 Hector Street. Most of the 202 Hancock project, the seven for-sale townhouses, was recommended for funding – $530,000 of $567,000, ~93.5% of the request. 5. At the Common Council meeting next Wednesday, the city is set to vote on reducing the fall-zone radius for cell phone towers, from double the tower’s height (200% of tower height), to 120% of the tower’s height. The move will potentially allow an iteration of Modern Living Rentals’s 815 South Aurora project to move forward with further planning and review. The 87-unit project was planned on the assumption of 100% tower height plus ten feet, so in the case of the 170-foot South Hill cell tower in question, the law would call for a 204 ft. radius, not 180 ft. as the developer hoped. But still, it’s a lot less than the 340 ft. it currently is. The developer may seek a smaller project, build taller, a greatly-revised footprint, or other options. We’ll see how it plays out. 5. House of the week. Back in March, it wasn’t certain whether 201 West Clinton’s “sawn-and-batten wood” would be left unpainted, or painted yellow. Looks like the former is correct, based on the east face of the 1-bedroom carriage house. The ZIP panels were still exposed on the other faces when I shot these photos, but based off what could be seen through the windows, interior work is progressing nicely, and the garage door has been attached. Local architect Zac Boggs and partner Isabel Fernández are building the 520 SF addition atop an existing 1960s garage. Just clearing out the photo stash. An interview with Marriott contractor Mark Lane of W. H. Lane Inc. can be found on the Voice here. Also, in the first photo, that’s probably the third-ugliest BMW in the world. The Carey overbuild is in the home stretch. Travis Hyde properties has started advertising the units on their webpage, with listings ranging from $1,300 for the micro-apartments to $2,800/month for the upper level two-bedroom units. There hasn’t been any move-in date posted, but presumably it’s before the fall semester starts. One thing that hasn’t been 100% clear is whether or not those panels inset with the curtain wall are the glass that’s supposed to in, or plywood placeholders. But apart from that, most of the work on the outside is complete – balconies and sunshades have been attached, but the sixth floor railing is still installing glass panels, and the ceiling to the third-floor patio has yet to be finished. The decision to apply the synthetic stucco was a good one, the color helps the overbuild blend in and gives it a more finished look. Local firm John Snyder Architects penned up the design, and the buildout was handled by LeChase Construction. After the metal stud walls and fireproof gypsum board went up, it looks like another layer has been applied to the exterior. On portions of the structure that will be covered by brick, a closed-cell spray foam was used. Architect Jason Demarest provides a link to Goodale Construction of King Ferry on his Twitter account, so that might have been the subcontractor. Closed-cell spray foam, made with polyurethane and applied a few inches thick, provides insulation under the brick. On areas that will be covered by metal panels and details, Huber ZIP panels have been attached. Some of the original cast iron was salvaged after the accident and will be reused, but I haven’t seen anything that indicates if all the exterior trim will be cast iron, or if the exterior will be finished with metal panels that have a similar appearance. Simeon’s, which is being built under a different contractor, is expected to reopen in June. Five apartments on the upper floors will hit the market later this year. Demolition and site preparation are the task du jour at the Hotel Ithaca at 222 South Cayuga Street. The north wing of hotel rooms is being demolished now, and the west wing of hotel rooms will be demolished once the new building is complete. The new 30,000 SF, 5-story wing will contain 90 rooms, 2,900 SF of additional meeting space, breakout rooms, and a new fitness center. 100 hotel rooms are being taken offline and demolished, reducing the number available at the hotel from 180 to 170. But, the primary goal of the project is to modernize the Hotel’s offerings, and stay competitive with newer hotels downtown, including the Marriott currently underway, and the Canopy Hilton due to start later this year. The project applied for, an received a 7-year tax abatement under the CIITAP program, making it the only project that has pursued the 7-year option over the more common 10-year enhanced option. CIITAP may not be popular from a P.R. standpoint, but as shown on Ithaca Builds, the high property tax rate downtown plays a large role in the program’s necessity. The Hotel Ithaca originally opened in 1972 as part of the city’s urban renewal plans, initially operating as a Ramada. At the time, it only consisted of the two-story wings, as seen in the 1973 photo above; the 10-story “Executive Tower” was added in 1984/85. The hotel was rebranded as a Holiday Inn until the start of 2014, when it switched to an independent operation as the “Hotel Ithaca”. The Hotel Ithaca was also the working name of the Marriott project early on, so the two projects are easy to mix up. As part of the change, the hotel carried out $2.4 million in renovations (phase one) to the tower rooms and utlities. Early plans called for a $17.8 million, 140,000 SF addition with a 9-story, 115-room hotel, restaurant and conference center designed by Buffalo-based Roberts, Shackleton and Boy Architects. The conference center was very well received by local officials and business leaders, and is seen as really crucial to Ithaca’s business interests – the city lacks the ability to host mid-size conferences and conventions (midsize meaning about 500 attendees), which sends conventioneers elsewhere. Currently, the lack of meeting space limits conferences to about 250 guests. The addition of a convention facility is seen as a major benefit to downtown retail, as well as other hotels that would handle overflow guest traffic. Convention traffic typically happens during weekdays, when regular tourist traffic is lowest. The plan was later revised to 8 stories and 97 hotel rooms, and then that didn’t move forward due to financial difficulties. The current project was proposed last September, and as the project had evolved, the tax abatement had to be re-voted (and passed 6-1). A potential third phase calls for a 3-story addition to the 5-story wing, and the coveted conference center, on the corner of W. Clinton and S. Cayuga Streets. The $15 million second phase is aiming for a completion in May 2017. About 21 new jobs are expected to be created, most of those service positions near or a little above minimum wage. Hart Hotels of Buffalo, founded by David Hart in 1985 and operating locally under the name Lenroc L.P., is the project developer. Krog Corporation, also of Buffalo and a favorite of Hart Hotels, is the general contractor. NH Architecture of Rochester, another frequent partner of Hart Hotels, is the project architect. Not a new construction, but a major renovation. scaffolding is up as the Student Agencies Building at 409 College Avenue undergoes major interior and exterior renovations to its second and third floors. As previously reported on the Voice, 9.660 SF is being renovated to make way for eHub, a co-working and business incubator space for startups founded by Cornell affiliates – students, faculty and staff. The project is part of a collaboration with the Entrepreneurship at Cornell program (eShip), and for its part, Cornell renovated about 5,000 SF of space in the Ag Quad’s Kennedy Hall to complement Student Agencies’ plans. As part of the renovations, 409, which was built in 1985, gets a major facadectomy – out with the brick and its punch-out windows, in with the glass curtain walls of fixed-frame window units with metal and granite detailing. The renovations will also add a rooftop patio space to the second floor. 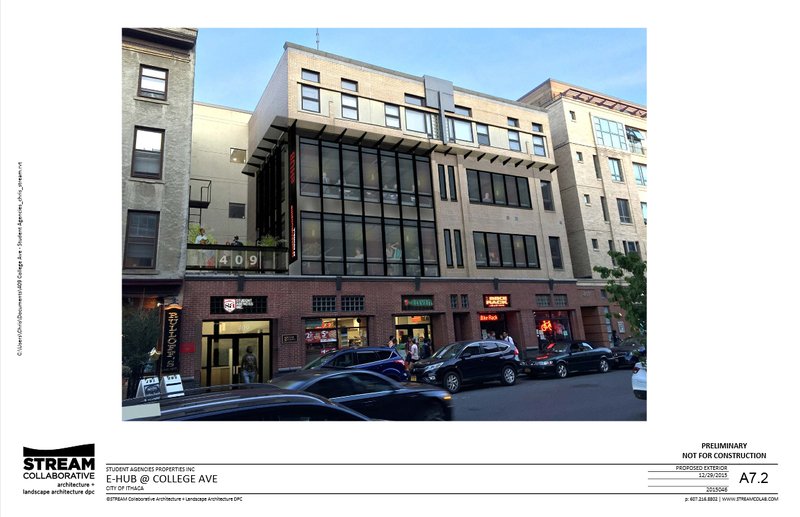 The project had to go through Design Review since it’s a major exterior change to an MU-2 building in Collegetown, and it ended up being one of the rare cases where the planning board encouraged a bolder design. The original design can be found here. The posters on the netting are the only copies of seen of the approved final design. The Bike Rack, 7-Eleven, and Student Agencies will remain option while the renovations are underway. STREAM Collaborative and Taitem Engineering designed the renovations (project design and energy efficiency improvements), and Morse Construction Management is the general contractor. All three firms are based out of Ithaca. The total cost for 409’s renovation is about $2.8 million. Plans call for a May opening.